The brain of the rover is a Raspberry Pi B that both talks to the RoboClaw and hosts a webpage used to control the rover. 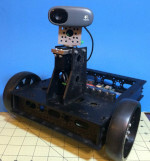 The webpage hosted on the Raspberry Pi is accessible by any device that has a web browser and features a large number of graphical controls to drive the rover and operate the webcam who’s video feed is visible on the same page. The Python-based framework Flask was used to build the page.